Love in the Age of War is the seventh studio album by Canadian new wave group Men Without Hats. Originally expected to be titled Folk of the 80s (Part IV), it was the first studio album by Men Without Hats in over eight years, and featured ten original songs written by Ivan Doroschuk. It is the only album to feature guitarist James Love before his replacement by Sho Murray in late 2016. It is also the only album to feature keyboardist Mark Olexson - he was replaced by Rachel Ashmore after the album was released. The songs were written by Doroschuk "in the back of the bus" while touring in the summer of 2011 with the Human League, and were recorded from December 2011 to February 2012. The album was released on May 22, 2012 in Canada, and worldwide on June 5, 2012. The first single from the album, "Head Above Water", premiered on Montreal's CHOM-FM on April 20, 2012. In addition to the members, Mark Olexson was featured on live keyboards and programming. "Head Above Water" was released as the first and only single from Love in the Age of War (the band's seventh studio album) on April 20, 2012 by Cobraside. The single was written by Ivan Doroschuk and produced by Dave "Rave" Ogilvie. ^ Raggett, Ned. Love in the Age of War at AllMusic. ^ "Men Without Hats Speak To SonicAbuse". Sonic Abuse. January 28, 2013. Archived from the original on December 23, 2016. 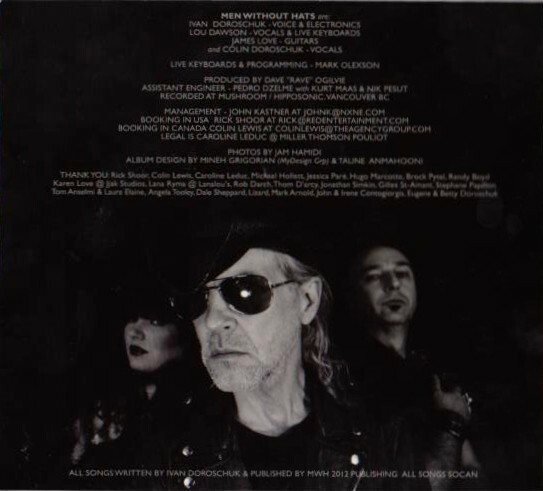 ^ Men Without Hats (2012). Love in the Age of War (CD liner notes). Archived from the original on 2018-10-24. This page was last edited on 16 December 2018, at 20:45 (UTC).